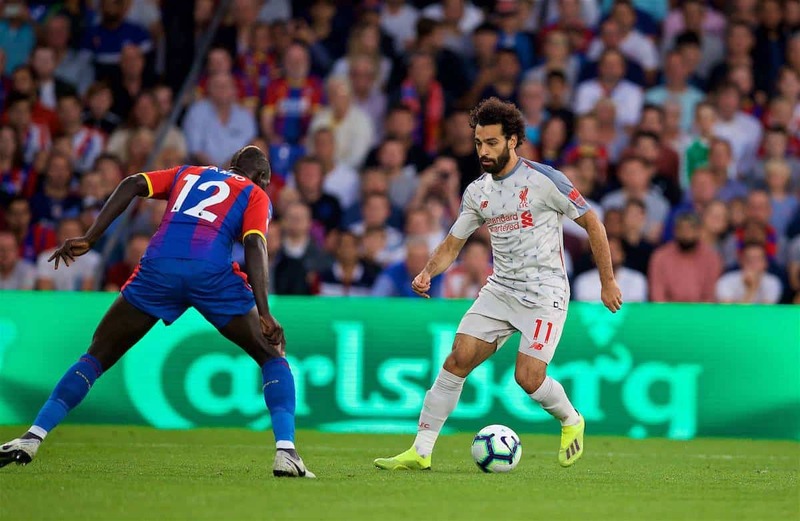 Liverpool look to have banished the ghosts of their difficult past at Selhurst Park as they earned a comfortable 2-0 victory over Crystal Palace on Monday. Though memories of dramatic collapses pervaded the buildup to the Reds’ trip to south London, Jurgen Klopp‘s side arrived on the back of three consecutive victories at Selhurst. Furthermore, buoyed by a 4-0 win over West Ham and an eight-day break at Melwood, Liverpool took to the field with an unchanged lineup. 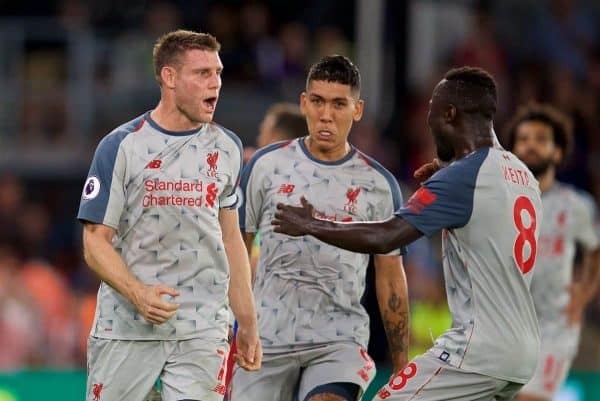 This meant the impressive midfield unit of Georginio Wijnaldum, James Milner and Naby Keita were retained, providing support for the imperious Mohamed Salah, Sadio Mane and Roberto Firmino. With their title rivals, Man City, thrashing Huddersfield Town the day before, the pressure was on to secure another three points, and they coolly got the job done. Wearing white, the visitors applied pressure early on, with Keita’s supply line to the front three particularly impressive, though Mamadou Sakho served as a steely presence at the back. A mistake from the ex-Liverpool centre-back almost gave them an opening on 19 minutes, however, but Salah was closed down before he was able to get the shot away. Pure brilliance from Keita should have crafted the Reds’ first, but after spinning into space in the left-back position and playing an inch-perfect long ball for Salah the Egyptian King failed to loft it over Wayne Hennessey. Then a lapse from Liverpool’s new No. 8 conceded possession to Andros Townsend in a dangerous area, with the Palace winger hitting the bar in a very close call. 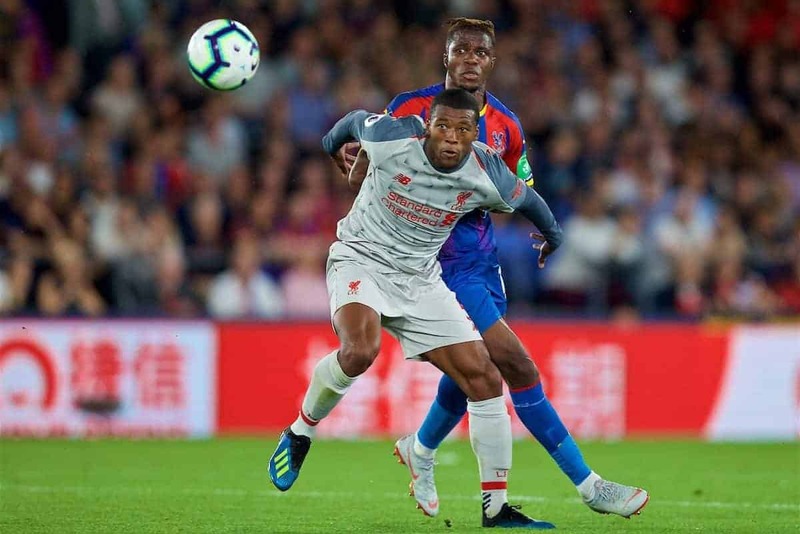 The Eagles aimed to play wide to Wilfried Zaha whenever possible, but the combined efforts of Joe Gomez and Trent Alexander-Arnold stifled their key man—with Christian Benteke familiarly listless. Another gift from Sakho gave Liverpool their opener on the cusp of half-time, bringing down Salah in the box, with Milner stepping up to convert. Minutes after kickoff in the second half Salah almost scored another, with Andy Robertson threading him through slightly too late on the break, before Keita fluffed the resulting cutback. A big save from Alisson to deny Luka Milivojevic’s free-kick drew a fist-pump from Klopp, with the Brazilian impressive both in shot-stopping and, more so, his impeccable distribution. The introduction of Jordan Henderson with 25 minutes to play emphasised the strength on Liverpool’s bench, and allowed Wijnaldum to move forward to provide ghosting runs from deep. With referee Michael Oliver in the thick of the action throughout, he had a big call to make when the otherwise impressive Aaron Wan-Bissaka brought down Salah when through on goal—rightly sending off the youngster. And the numbers game paid off as Mane netted a late settler, after another fine break from a Palace corner, earning another vital victory.